Take a journey in The Emerald Doorway (Three Mystic Crystals) book to find out about the capture of this 747 airliner by Captain Kalem with his extra-terrestrial space ship revealed in this Contact Over the Bermuda Triangle Scene. Aboard the jet are General Harry Faldwell, Senator Judith Cranston, and Diplomats from around the world. This 747 jet is captured by Kalem’s ship with Harry, Judith, and diplomats aboard. 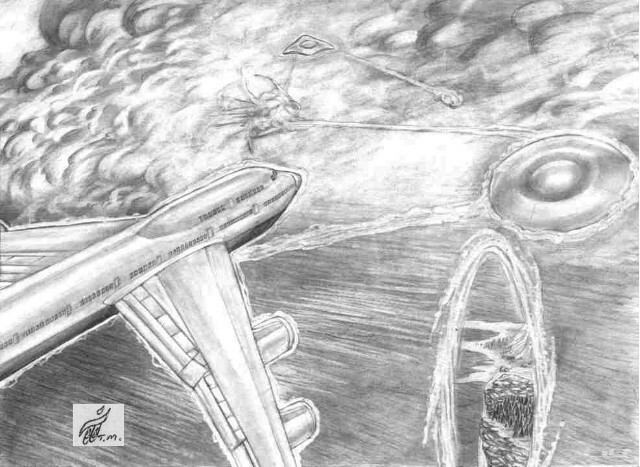 Look carefully at this illustration to see that another alien ship is firing upon the 747 jet and at Galactic Alliance Scout ship in an attempt to actually destroy its pilot Captain Kalem. Note: You can view illustrations of these characters involved in this dynamic Contact Over The Bermuda Triangle Scene or to obtain the book click on the provided links below. 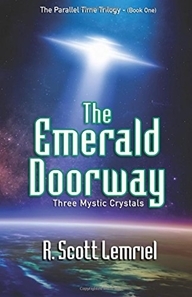 They are all inside The Emerald Doorway (Three Mystic Crystals) book one of The Parallel Time Trilogy.